Flan pâtissier, tarte au flan, different names for the same thing. It’s a traditional and classic dessert that is simple and quite delicious, a kids and adult’s favorite in France. It’s not considered sophisticated nor fancy, just a simple sweet grab-and-eat little dessert that is sold all over the place. Sometimes, that’s all you need. I loved to buy a slice of flan on my way back home from school at 5 pm. Gone in a few minutes and such a treat. Every boulangerie in France has its own. I went to La Boulange yesterday, if you live in San Francisco, you know what I am talking about, if not, it’s a French bakery opened by a boulanger Bordelais (a baker from Bordeaux) and that sells traditional French pastries like this one. Since I saw La Boulange‘s tarte au flan in display, I started to have a craving and think about France and memories came rushing back. I am like a kid, I see something, and I get a craving, then I need to have it. For me tarte au flan represents my childhood but most of all my teenage years when I was dieting all week, except on Wednesdays which was the day of indulgence. Every Wednesday afternoon in high school (since we had no school on Wednesdays), with my best friend, we used to go down town and went for a tour of all the bakeries in town, stuffed ourselves with flans, coconut croissants and pithiviers and talk about it for hours. It probably messed up all the week’s diet, but we couldn’t care less. La gourmandise est un joli défaut, that’s what I say, it makes you appreciate things so much better! While our girlfriends were busy with boyfriends, we were busy with pastries. Even though there is the name “Flan” in there, it’s not really like a flan caramel or a regular flan. It has flour in it, therefore can cook at high temperature and the flan will be fine. It also has a different, more compact consistency. You can use milk only, then you would need 500 ml if you don’t want to use the cream. Also, if you want to add a little twist, you can replace milk by coconut milk. I know my quantities might seem odd, but I use the metric system that gets converted into the imperial system so I get some uneven numbers in ounces and cups. You can always round them up. Place flour in a container, add yolk and butter, gradually add water and with your hands mix carefully to somehow incorporate all the ingredients but do not over knead the dough. When you have incorporated all the ingredients, form a ball and wrap it in a plastic foil. PLace in the refrigerator for about 30 minutes. Roll dough and place in a deep dish and about 20 cm diameter. Place parchment paper on the surface of the dough and cook for about 15 minutes in a pre-heated oven at 370F. Remove paper and cook for an additional 5 minutes. remove from the oven. Mix eggs and sugar until the mixture has doubled its volume. Add flour and vanilla extract. In the meantime, in a pot add milk and cream with vanilla pod. Bring the mixture to a boil and add to the eggs mixture. Pour filling into the crust. Cook in a 370-375F oven for about 30-45 minutes depending on your oven. The top needs to be golden brown and the cream firm all the way through. This entry was posted by silvia on October 2, 2009 at 7:47 pm, and is filed under Desserts. Follow any responses to this post through RSS 2.0.You can leave a response or trackback from your own site. oh my gosh! I grew up eating this for snack too? Are we neighbors or something? This looks incredibly yummy – - Now, I’m craving for one! Ok, I can’t decide which I like better – your wonderful food, or your great stories. (All food has some kind of story, right?) I guess it’s a tie! you know that this is a typical parisian dessert ! i wish i could have my childhood wednesdays like yours. 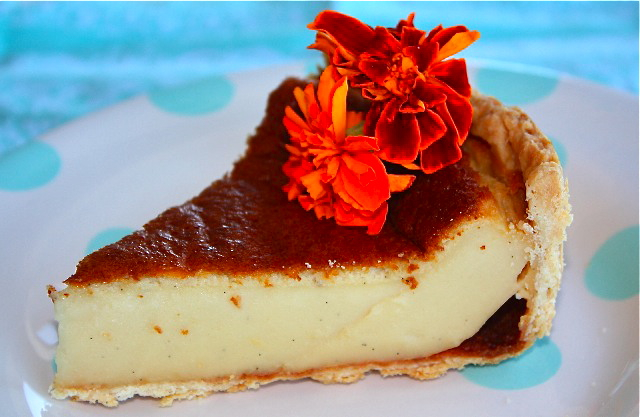 this tart looks perfectly elegant! love the flower decoration! This is going in my recipe file — it looks amazing. Mais quel délicieux flan. Tout à l’air tellement bon chez toi. Merci Helene, je crois que les couleurs y sont pour beaucoup! Ahaha our only afternoon off was Wed afternoon, all week was school from 8 am to 6 pm. It’s a casual, classic dessert that kids love. Entre le flan patissier et moi, c’est une histoire d’amour. Et cela me manque depuis que je ne vis plus en France. J’ai déja testé plusieurs recettes sans encore avoir trouvé LA RECETTE, celle qui me fera chavirer…. Je vais donc essayer la tienne….